April showers bring May flowers! Here in Florida, we get afternoon showers quite often. I don’t always resort to staying inside if it’s a rainy day. We’ll sometimes just head on out with our rain boots and dance in the rain! My oldest loves to find the biggest puddle she can and jump right in. What kid doesn’t love jumping in puddles? I consider it a childhood rite of passage! This rainy day fun sparked an idea for learning. We decided to play a sight word game with puddle jumping to combine some new literacy skills with some gross motor activity. 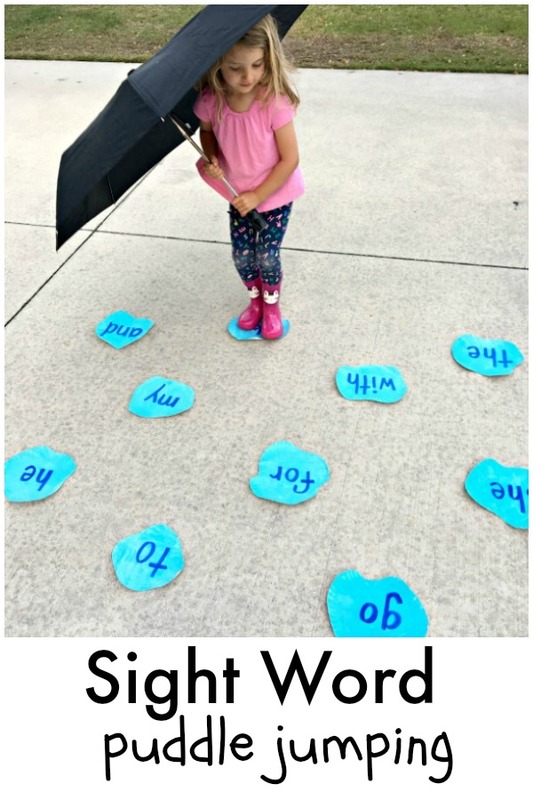 Sight word puddle jumping is perfect for a rainy day activity if you choose to do this inside, or you can set it up outside like we did. 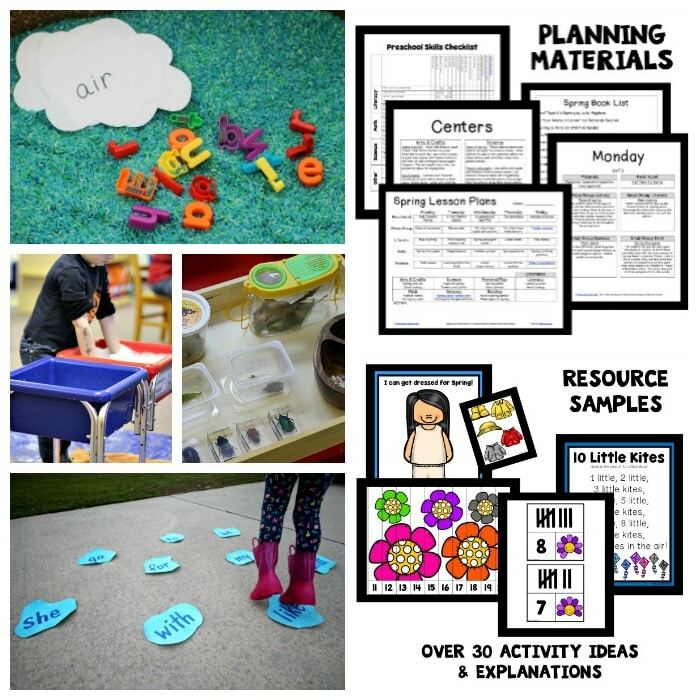 FIND EVEN MORE SPRING THEME ACTIVITIES IN OUR PRINTABLE SPRING LESSON PLANS. We prepared this activity by cutting plain 9 inch paper plates into puddle shapes. 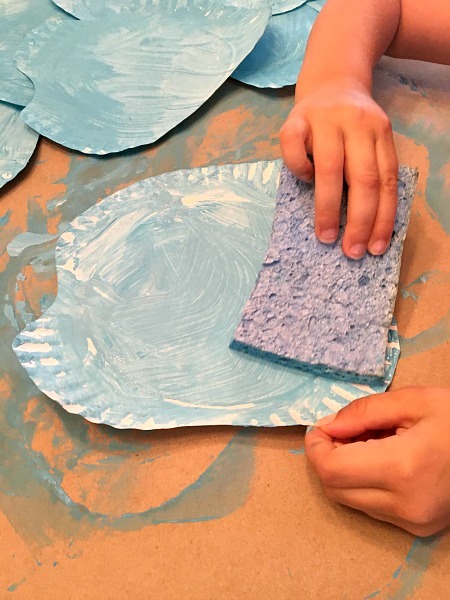 I then invited my preschooler to help me paint the plates blue. I grabbed a sponge to paint with as it would allow her to cover more ground as she painted. Once the plates were dry, I wrote some sight words that we’ve been practicing onto them. 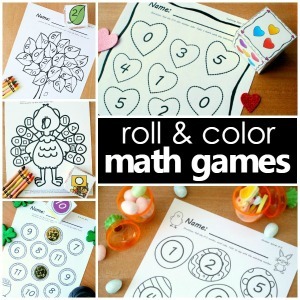 You can easily switch this activity up by writing numbers, letters, color words, or shapes onto the plates. We set the “puddles” up on our driveway by securing them down with some painter’s tape. This ensured that they didn’t fly away with the wind, or move around as she landed on each plate. What fun is puddle jumping without rain boots and an umbrella? 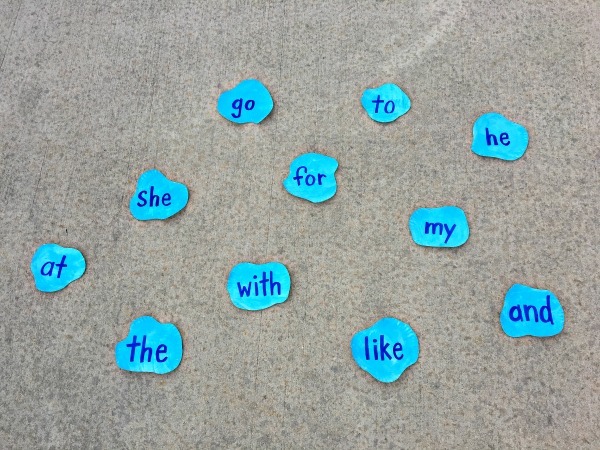 Once my preschooler was all decked out for the fun, I began by calling out sight words and asking her to jump to them. 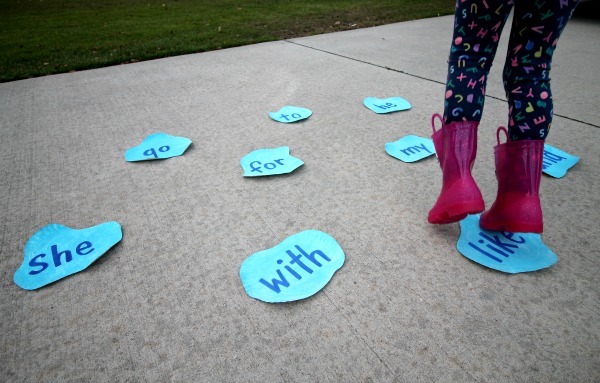 She would scan the puddles which was a great review, find the right word and SPLASH right to it! We then switched up the activity a bit by allowing her to choose which puddle she would jump to. Once she landed on each word, she had to shout it out. 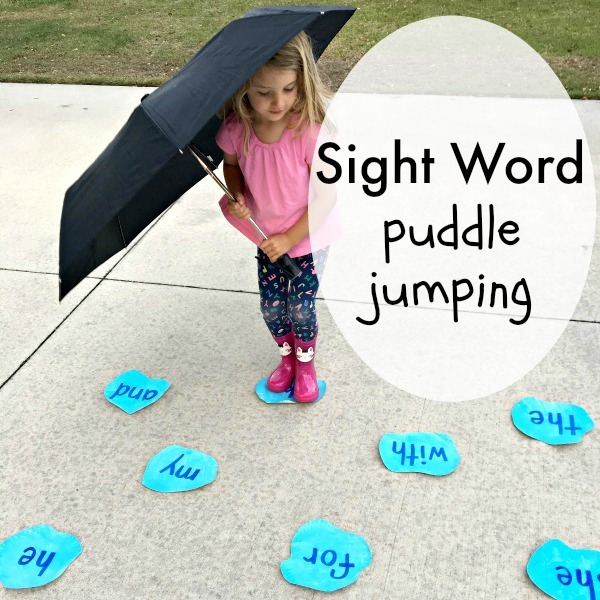 This was such a fun gross motor activity that combined a love for splashing in puddles and some learning at the same time! 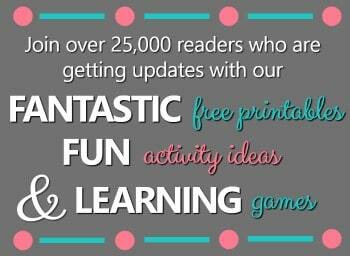 We’ll definitely be doing this activity some more as it was a big hit! It’ll be perfect for an indoor rainy day activity too. After you’re done snuggle up together and read some fun books about rain and puddles. Some of our favorites are below, but you can see book summaries and more ideas in our full puddle activity and book list and our rain and rainbows book list. What are some ways you get your kids moving and learning at the same time?